Navaratri is celebrated in different ways by various communities. 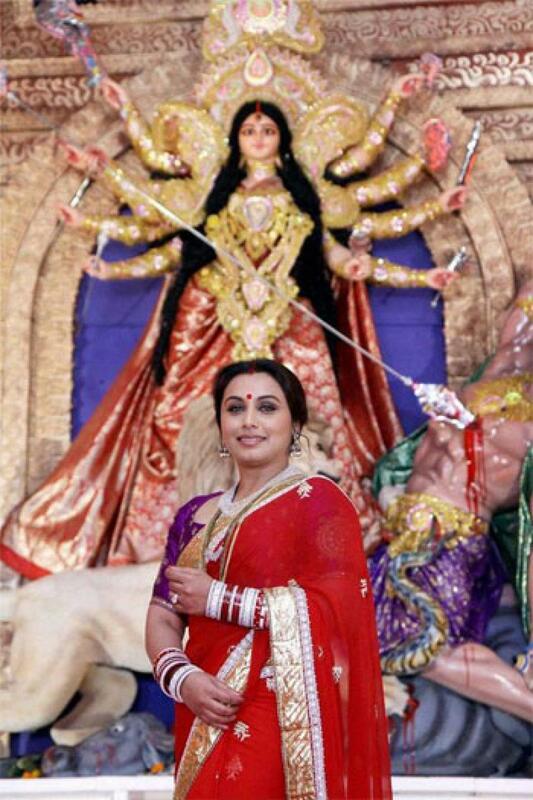 The last four days of Sharad Navaratri are celebrated on a grand scale by Bengalis. This being their biggest festival, exquisitely crafted and decorated life-size clay idols of Goddess Durga depicting her slaying the demon Mahishasura are set up in temples and pandals and these are immersed on the fifth day. Gujaratis and Maharashtrians celebrate with the famous Garba and Dandiya-Raas dance. Various communities and cultural associations have been organising the ‘Navratri Festival Celebrations’ on a regular basis for the nine days. Many convention centres do play host to various Dandiya and Garba events. Telugu speaking people rig up steps and place idols on them. This is known as golu in Tamil and Bommala Koluvu in Telugu. Saraswati Puja will be performed on the eighth day, wherein students sit before the idol of Goddess Saraswati (a form of Goddess Durga) and pray for educational excellence. Ayudha Puja is observed on the ninth day and various equipments like computers, kitchen tools and vehicles are worshipped. The effort is to see the divine in the tools and objects one uses in daily life and is central to this celebration. So it includes all tools that help one earn one's livelihood. Knowledge workers go for books, pen or computers; farmers go for the plough and other agricultural tools; machinery for industrialists and vehicles for transportation workers—all these are decorated with flowers and puja performed on this day invoking God's blessing for success in the coming years. It is believed that any new venture such as starting a business or purchasing new household items on this day is bound to bring prosperity. Keralites celebrate Ashtami, Navami and Vijaya Dashami as Saraswati Puja in which books are worshiped. Books are placed for puja on Ashtami in houses, traditional nursery schools, or in temples. On Vijaya Dashami, the books are ceremoniously taken out for reading and writing after worshiping Goddess Saraswati. Vijaya Dashami day is considered auspicious for initiating the children into writing and reading, which is called Vidyarambham. First three days: The Goddess is separated as a spiritual force called Durga, also known as Kali, in order to destroy all evil and grant boons. Second three days: The Mother is adored as a giver of wealth, Lakshmi, who is considered to have the power of bestowing on her devotees inexhaustible wealth, as she is the Goddess of Wealth. Last three days: The final set of three days is spent worshiping the Goddess of Wisdom Saraswati. In order to have all-round success in life, believers seek the blessings of all three aspects of the divine femininity, hence the nine nights of worship.